The United Kingdom has some of the tastiest home made cakes in the world. Many of them orginated hundreds of years ago in small towns around England and Wales. Here are six of the best. 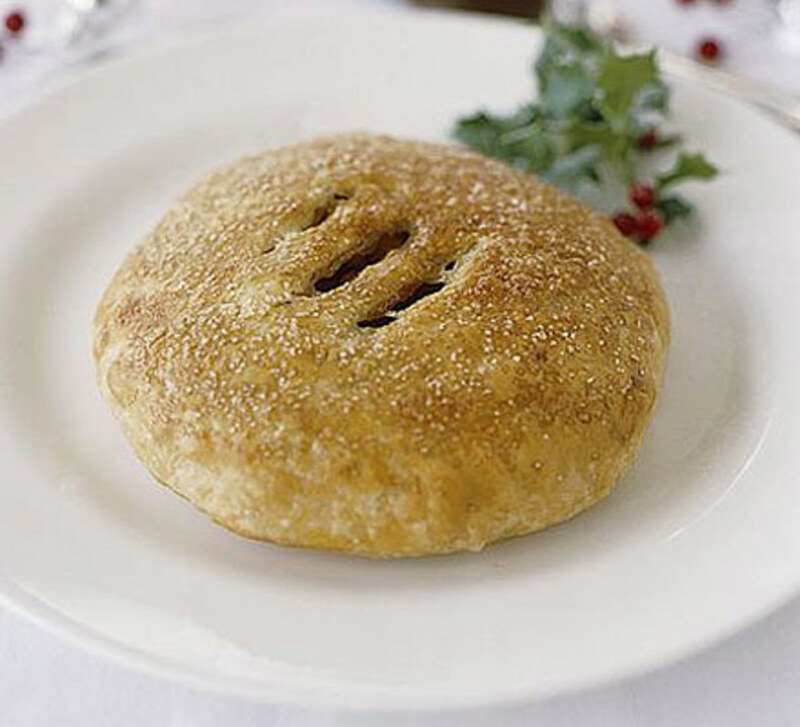 Eccles cakes are a delicious snack that originate from the small town of Eccles, just outside of Manchester in England. 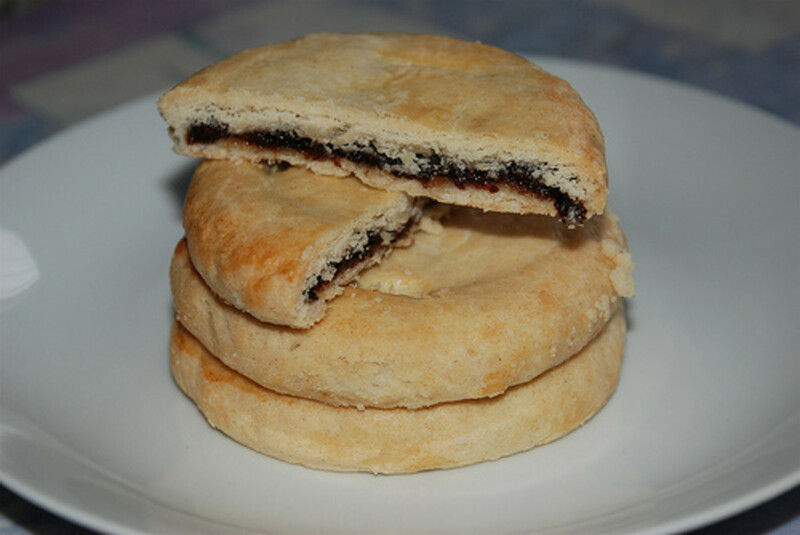 Records show that James Birch began making Eccles Cakes in a shop opposite Eccles Parish Church in 1796. They have become so popular that they are available all around the world. They are made from flaky pasty that is filled with squashed, sweet and juicy raisins. The cakes are relatively easy to make and take around 20 minutes to prepare and 15 minutes to cook. 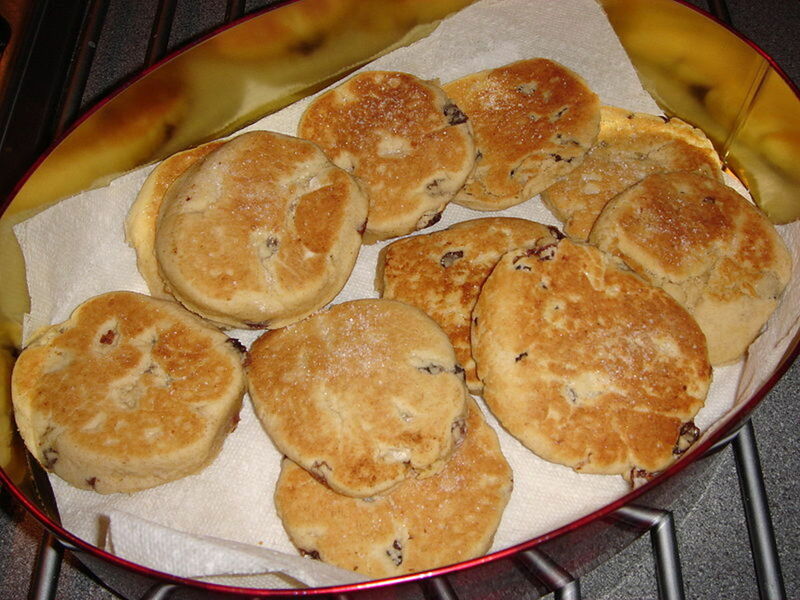 Welsh cakes are traditional snacks that come from Wales in the United Kingdom. 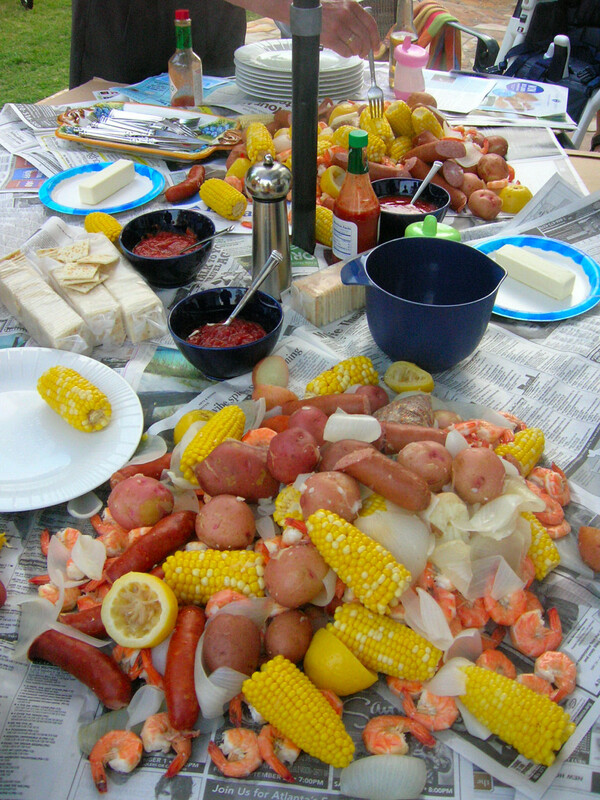 The recipe has been passed down through generations and is now as popular as ever. They make a tasty treat for children or a great snack for adults, too. 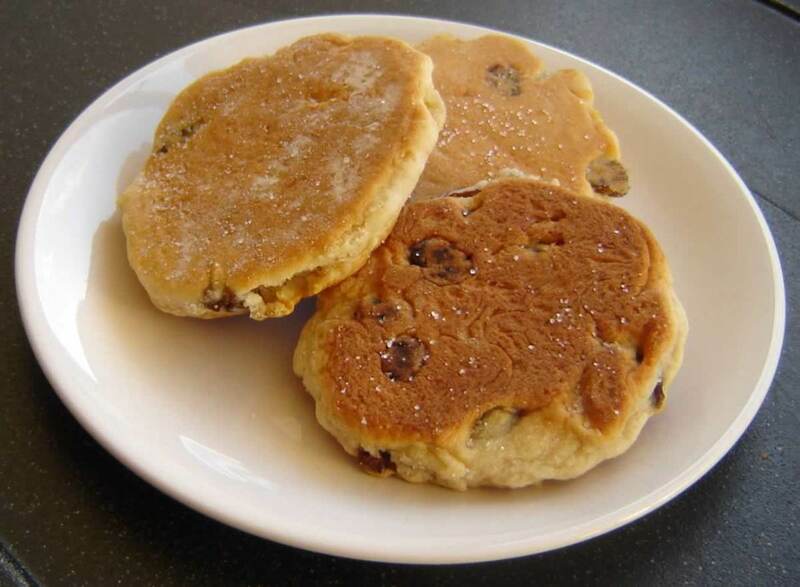 Some people say Welsh cakes taste similar to scones, but Welsh cakes are smaller, softer and not as dry as scones. They can also be eaten just as easily without adding butter, jam or cream. The cakes are flat and sometimes known as bakestones because they are cooked on a flat bakestone. The cakes are made from flour, sultanas, and raisins or currants. They may also include spices such as cinnamon and nutmeg. Their size is usually between 4cm and 6cm in diameter and they are around 1cm - 1.5cm thick. 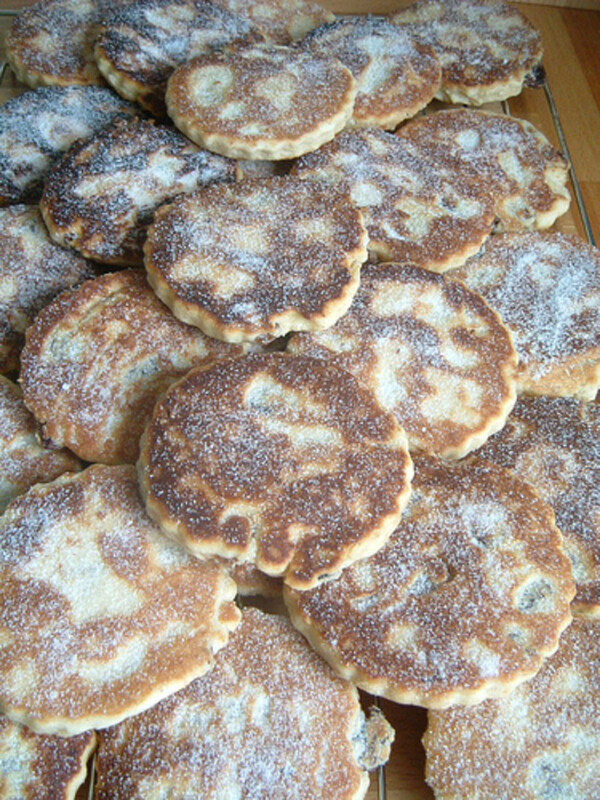 Several manufacturers produce Welsh cakes to sell in supermarkets and shops around Wales. 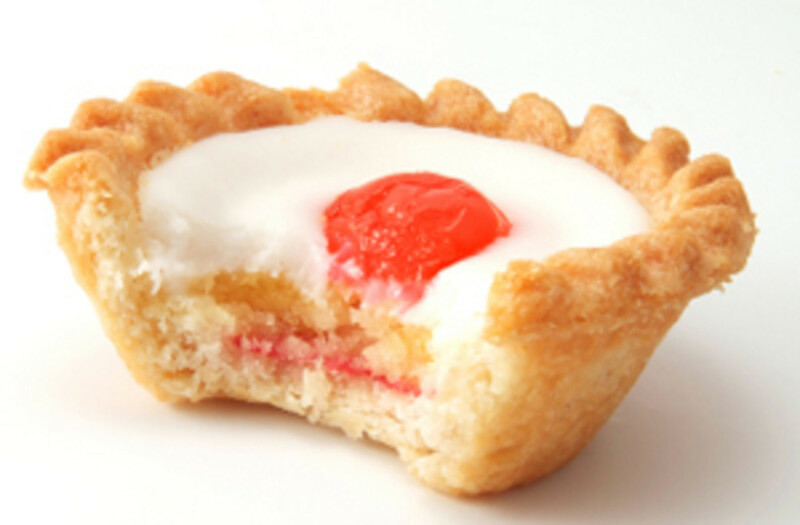 The Bakewell Tart is said to have been created after a chef mixed the wrong recipe and came up the Bakewell Pudding. This is said to have happened at the Rutland Arms in the small town of Bakewell in the Derbyshire Dales in England. The tart is made from shortcrust pastry filled with a sponge cake filling, a layer of jam and an egg and almond filling. This is then topped with white fondant icing. On top the fondant is a red cherry, also giving the cakes the name of cherry tarts. Bakewell tarts are very sweet. They have become very popular throughout the United Kingdom and they are manufactured by several large cake producers including Mr Kipling. They can be made in the size of small cup cakes or as larger cakes. The Bath hail from the spa town of Bath in the South West of England, and, they were intended to be eaten - in the bath. The buns date back to 1763 and they are still produced in the Bath region. They were first made by Dr W. Oliver, an 18th Century physician who treated visitors - including Queen Victoria of England - to the famous Bath Spa. The spa waters which flowed from underground were said to heal patients of many ailments. Dr Oliver's bun proved so popular, and his patients grew so fat, that he had to invent a plain biscuit for his patients to eat instead. This was called the Bath Oliver biscuit. The chunks of sugar sprinkled on the top of this otherwise rather plain bun were originally sugar-coated caraway seeds. The London Cheese Cake is a delicious cake that is found mainly in bakeries in London, England. It is totally unique and should not be confused with the other type of cheesecake. Why they are called cheese cakes is a bit of a mystery as they don't actually appear to use cheese in them but it's probably because that the shredded coconut resembles grated cheese. 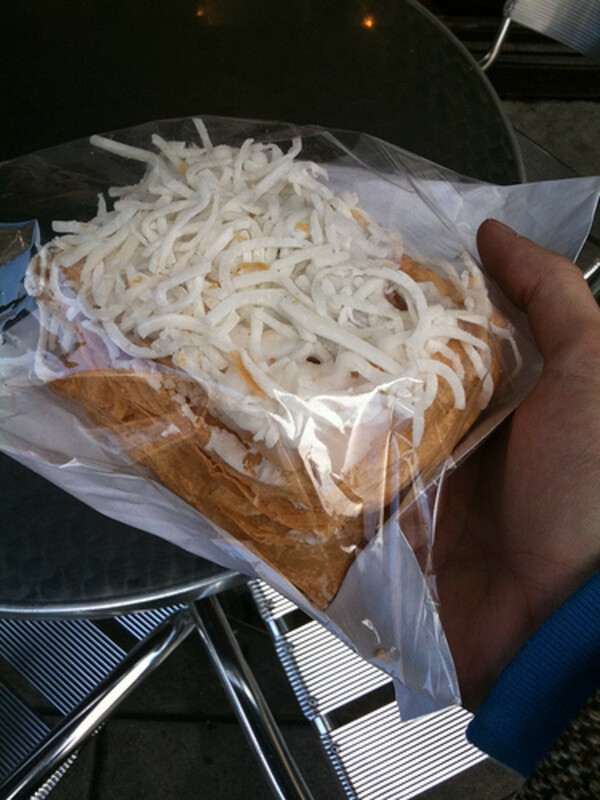 They have a base of flaky pastry topped with icing that's full of coconut shreds. Sometimes there will be sweet strawberry or raspberry jam filling.Without a doubt these cakes are of England's finest cakes. However, they are yet to be mass produced by a large bakery and for that reason are confined to local bakeries in London where the family recipe has often been handed down and perfected through the generations. Another London Cheese Cake, guvnor!? Lovely jubbly! The London borough of Chelsea may currently be world-famous for it's football team, Chelsea FC, and their super-rich owner Roman Abramovich. But there was a time when Chelsea was most famous for one thing - it's buns. 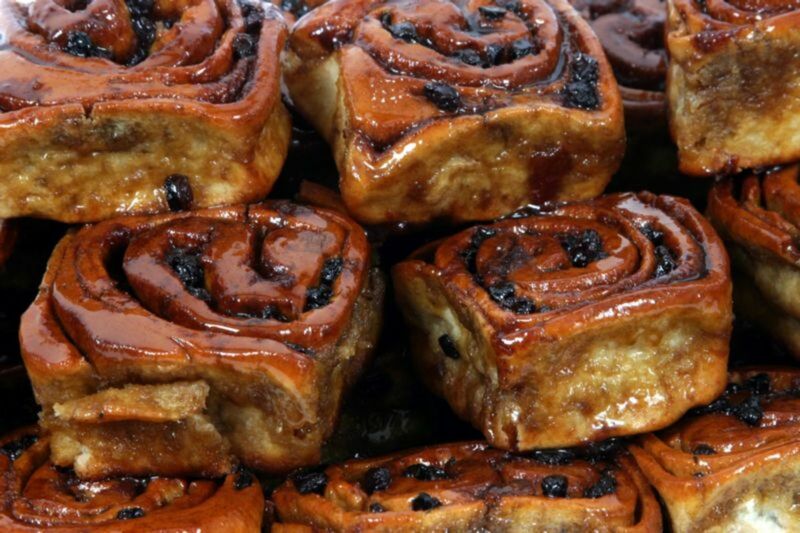 The buns themselves originate from the Chelsea Bun House which was situated near Pimlico in central London. The famous author Johnathan Swift visited the shop in 1711 to buy a plain bun. In the shop's 18th Century heyday it was run by Richard Hand and owned by George II and Queen Charlotte. Charles Dickens, author of Hard Times and A Christmas Carol, even visited the shop and mentions the shop in the books Barnaby Rudge and Bleak House. A local poet said the buns were ''Fragrant as honey and sweeter in taste! As flaky and white as if baked by the light, As the flesh of an infant soft, doughy and slight.'' 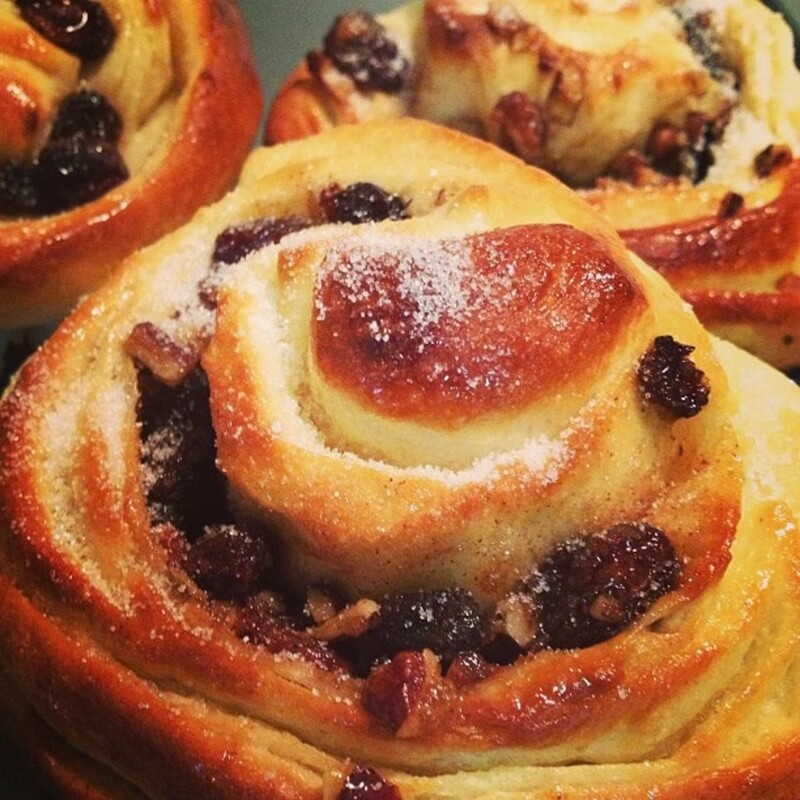 The Chelsea bun is actually one of the few UK cakes to contain a strong cinnamon kick. They are square and made from a deep roll of raisin-spotted dough. They can be enjoyed in the traditional way or by unrolling the spiral. There are several other well known cakes that are named after the places that they originated from. Here's a selection of those cakes a brief description of each one. Chorley cakes. Chorley cakes originate from the small town of Chorley in Lancashire, England. Like the Eccles, which is a nearby town to Chorley, this cake is full of raisins. The only difference is in the pastry which is less flaky and more like a biscuit. Tottenham sponge. The Tottenham Sponge comes from Tottenham in London, England. This is the same place as the famous football team Tottenham Hotspurs FC. This is a sponge cake topped with jam and occasionally sprinkled with desiccated coconut flakes just like the London Cheese Cake. This is a rare cake that is mostly found in local bakeries around London. Battenberg cakes. 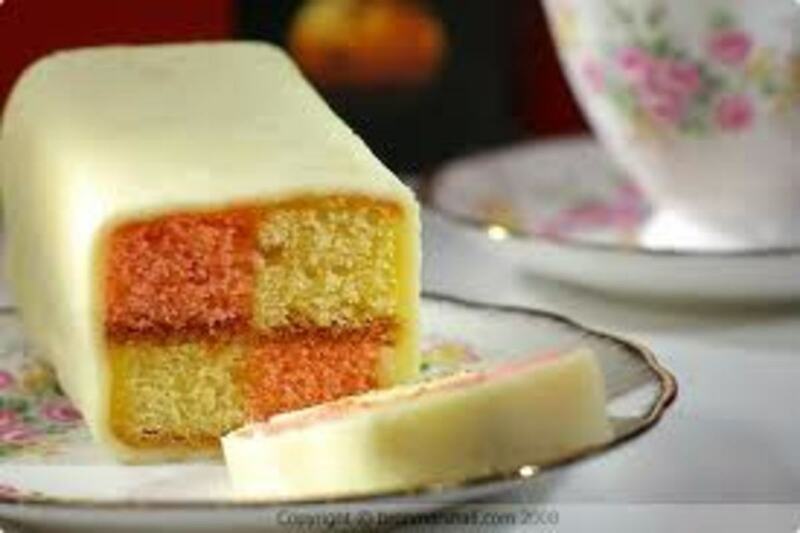 The Battenberg cake comes from the town of Battenberg in Germany. The cakes are famous for their light sponge decorated in a pink and yellow check pattern. Apricot jam separates each part of coloured sponge. The whole cake is then coated in marzipan. Battenberg cakes are said to have been baked to honour the marriage of one of Queen Victoria's granddaughters to Prince Louis of Battenberg in 1884. Each of the four squares is said to represent one of the Battenberg princes. Madeira cake. Madeira cake is a very plain type of cake that is named after the Portuguese island of Madeira. The sponge cake has a firm but light texture and is traditionally flavoured with lemon. Butter or jam is often spread onto slices of the cake before they are eaten. Belgian buns comes from Belgium. They are made from a very sweet yeast dough and contain sultanas. This is then topped with fondant icing and half a glazed cherry. The buns are very sweet and taste great with a cup of hot tea. Danish pastries havve a moist, chewy and quite a heavy pastry. There are several varieties and shapes. 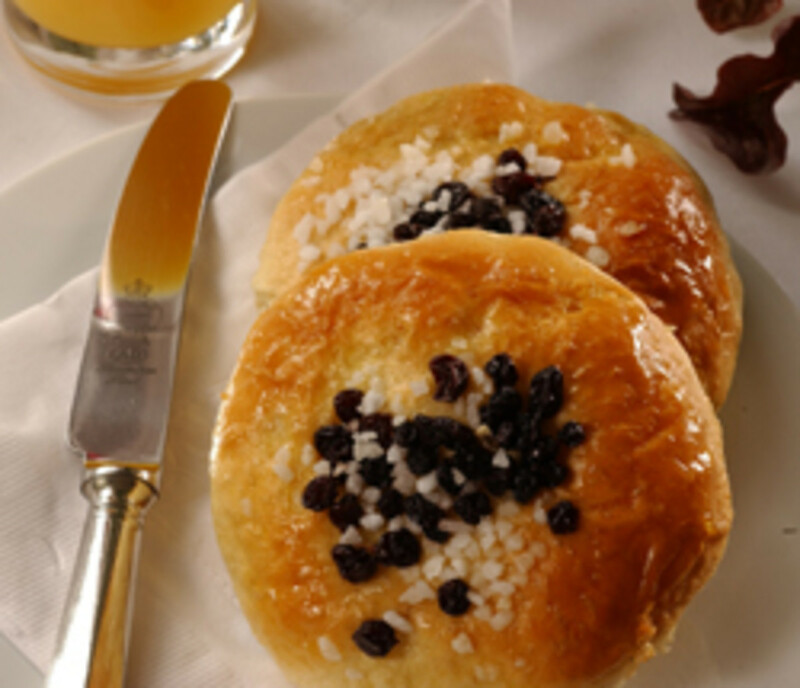 The simplest is the Fruit Danish, which is a swirl of pastry with raisins. The Custard Danish, The Apricot Danish and the Apple Danish come in different shapes. These flavours are shaped by folding two corners of a square of pastry and having them meet in the middle. Portuguese Custard Tarts are similar to popular custard tarts but they are smaller with a pastry base that's a stout and chewy flaky pastry. Portuguese Custard Tarts also quite a bit sweeter with that caramelised topping replacing the nutmeg. They come from Portugal and are very popular among the native people there. Chelsea Buns - an English Bun with a past!